Why make two trips to the kitchen, or hang around waiting for the kettle to boil when you can just ask Alexa to put the kettle on? This project uses as few components as possible and is really easy to follow but it does involve tinkering with mains powered devices and water. So be careful and always make sure the kettle is unplugged when working on it! You will need to know how to solder to complete this hack. I've published a demo version of the Skill HERE. If you add this to your Alexa account then visit the Shiftr Namespace HERE you will be able to say "Alexa, put the kettle on" and see a blip move around the node map to the device brewTime-TEST. You can also see the state of the request in the top left corner. The device brewTime-01 is the kettle in my house, you can't control this but you can see it's state. Let's get your MKR1000 talking to Alexa before we start hacking the kettle. This involves creating an Alexa Smarthome Skill, an AWS Lambda function to handle the requests from Alexa and using Shiftr.io to communicate with the MKR1000. This service allows your MRK1000 to talk to AWS via a simple protocol called MQTT. Make a note of your key and secret, you'll need these later. Make a note of Client ID and Client Secret, we will need these later. *** Leave this tab open, we will need to come back here later! This is super easy! The steps here will provide you with the bare minimum required for a working Smart Home skill. Language = Choose your region e.g. US or UK - this is important and has to match your Alexa device and Lambda function region. This creates the skill. Note the skill ID near the top, underneath your skill name. In the top right corner of the page next to Support will be a geographical region. e.g. "Ireland" or "N. Virginia". Click this dropdown and choose Ireland for an Alexa Skill in the UK, or N. Virginia for US. I'm not sure what other regons are needed for Alexa in other countries. Role = Create a Custom Role which will launch a new tab. Click Allow. This will create a new role named lambda_basic_execution and automatically insert this role into the Lambda basic information dialog. If after you click Allow the Role changes to Choose an existing role, then select the Existing role named lambda_basic_execution from the box below. Step 2: In the Add Triggers List, click Alexa Smart Home, then scroll down to the box titled Configure Triggers. If you can't find the Alexa Smart Home trigger it's becasue your Lamda function is in the wrong region. Try creating a new function in a differnt region. Step 3: Click on the name of your function in the layout box at the top of your page e.g. SampleLambdaFunction, it has an orange icon. In the top right corner, note the Lambda ARN. Now that you have all the components, let's put everything together. Click on Developer Console in the top right corner if you are not redirected. The Configuration page for your Skill lists several Redirect URLs (shown in green above). Open the LWA security profile you created earlier (the tab that you left open) and click on the Web Settings tab. Click Edit and provide each of the Redirect URL values from your Skill in the Allowed Return URLs field. Click Save. If you chose a different device ID when creating the Lambda function, then change MQTT_DEVICE_ID here to match. Connect your MKR1000 with a USB cable. On the Tools menu again, where it says Port: xxxxx select the correct port, e.g. COM10 (Arduino/Genuino MKR1000) This may already be selected. On the menu click Tools > Serial Monitor to open the serial monitor window. Open https://shiftr.io/ in your browser and login to your dashboard. You should see a variable appear in the list on the left called BrewTime/Actual and a blip moving around the nodes every 10 seconds. Make sure you have an Alexa device associated with the account. If not, in another tab visit https://echosim.io/ and setup a virtual Alexa on your Amazon account. Once you have an Alexa device setup Go to Skills > Your Skills (in the top right corner) then click on Dev Skills. Allow LWA access, and you should see a message that says you can close this window. Close that window and you should be presented with a popup asking to discovery devices. Click Discover Devices. Now with your Alexa device, try "Alexa, put the kettle on", Alexa should respond "OK" and the LED should light up on the MKR1000. This video shows you how to wire up your MKR1000 and Logic Level Converter to the kettle. You can also refer to the wiring diagram, PCB image and schematic below for more info. I chose this kettle because it had low voltage pushbuttons and a digital display. This makes it much easier to interface with the Arduino than a conventional kettle with a 240v switch, although the routine for turning it on and off is a little complicated. It also has all the electronics in the base, which gives us more room to add things and it's completely separate from the 3kW heating element and water! The process for boiling the water requires pressing the power button (unless the kettle is already powered on). Then pressing the temperature button, once only, pressing it again within 5 seconds will change the temperature. To stop the kettle we can just press the power button once, but we need to make sure it is actually on already. To get the Arduino to simulate pressing these buttons, we simply connect one side of the button to GND for 150ms. We can read the state of the kettle by monitoring the LED backlight voltage, this will tell us if it's powered on, and checking for +5v on the HEAT control wire to see if the kettle is actually boiling the water. 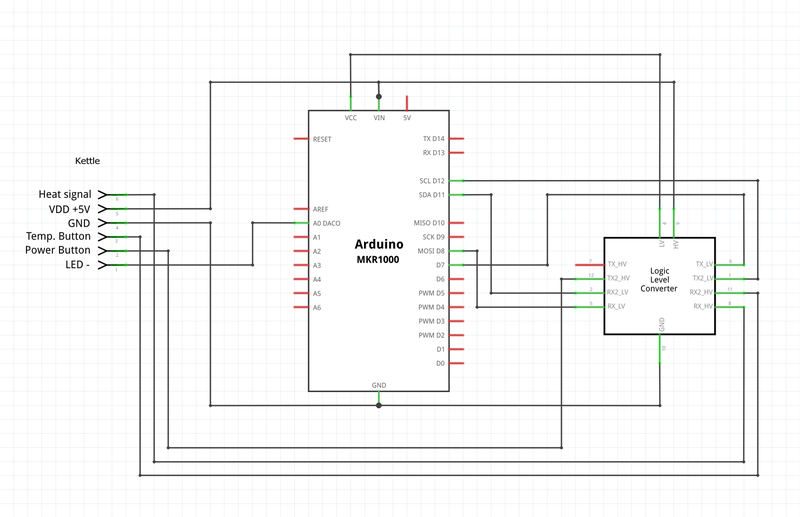 As the MKR1000 I/O pins operate at 3.3V we need to use a logic level convertor to step the voltage up and down to interface with the 5V kettle. The voltage between the LED backlight negative pin and GND is between 2 and 3 volts, so this can be connected directly to the MKR1000's analogue in pin. Why use shifter as the MQTT broker and not Arduino Cloud or AWS IoT? At the time of writing Arduino Cloud is still in alpha and is fairly unreliable. This would be the obvious choice once they have worked out all the bugs. AWS IoT also integrates very nicely with Lambda, however it only supports certificate-based authentication and this can't be done easily with the MKR1000 at the moment. 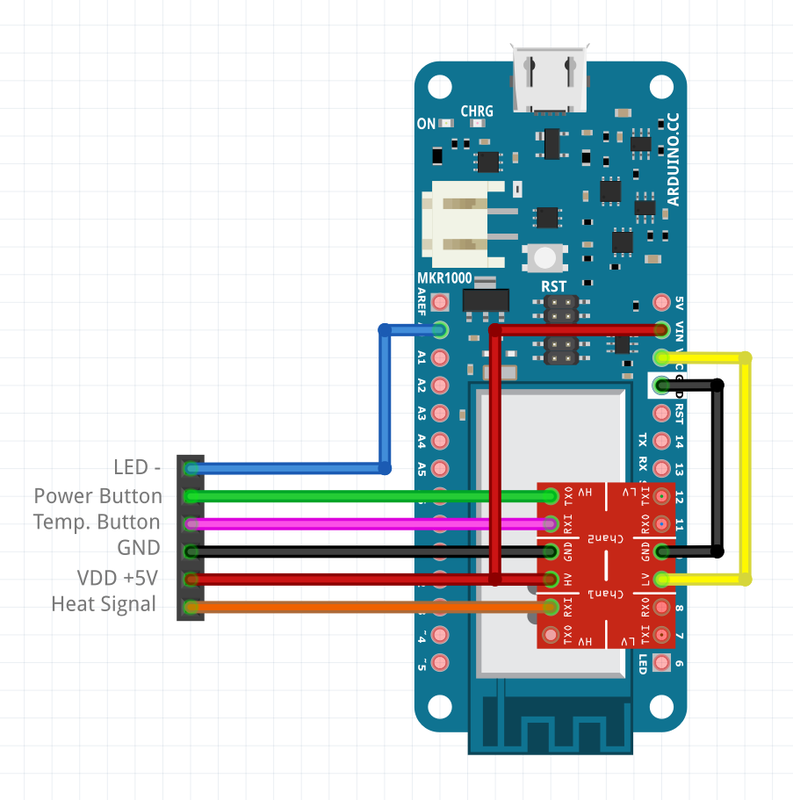 How to connect up the MKR1000 and Logic Level Converter to the kettle. Contains the AWS Lambda function and the Arduino MKR1000 sketch.